“The existing conveyor was 12 years old; it was extremely noisy, very unreliable, difficult to maintain and, of course, couldn’t handle the M&S totes. So, to meet the terms of the M&S contract we had to invest in a new conveyor solution. 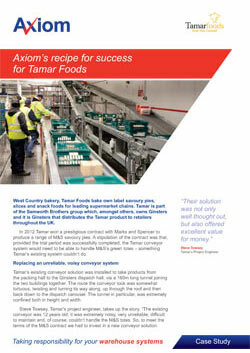 “The new system not only had to handle the M&S totes, but also our own cardboard cartons which vary in size and shape. In addition, we wanted it to have an accumulation capability. The old system didn’t have this and with our very high throughput rates it caused endless problems. An issue anywhere on the system meant we had to stop the entire line, which led to product piling up and high levels of inefficiency.